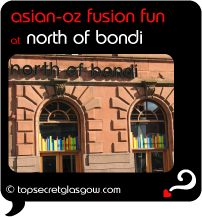 North of Bondi sits on a prime spot, on the junction of Byres Road and Dumbarton Road. Inside, cool décor provides an air of the calm and tranquil, while diners watch the busy West End go by. Food comes in hearty portions, showing a unique mix of eastern and Australian tastes. So tempura with lime leaf sweet chilli sauce can be found on the same menu as great big sesame rib-eye steak, and Malaysian yellow vegetable curry. What fun! Great news! Finding this page means you can now join our VIP list for North of Bondi. Time to grab your very own page all about North of Bondi. Do you have a special story about North of Bondi? A funny experience? A grand occasion? A funky photo? A personal tip? A top secret? underground Kelvinhall in the hood!